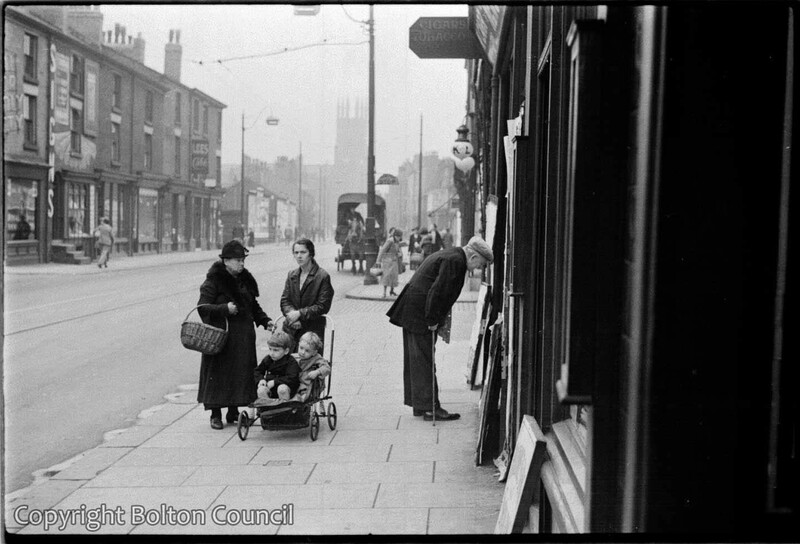 Pedestrians on Newport Street in Bolton town centre. My Brother Dennis told me that the lady who had the paper shop where the pram is. used to sit behind the counter for years and years and when she died the floor was full of pennies and half pennies. The paper shop mentioned by Norman was owned during the 1920’S by a Great Uncle of mine, RW Carr, sometimes called Bobby or Billy Carr. He was famous during the 20’s, when the Wanderers won the FA Cup three times, for walking to Wembley wearing clogs and pushing a wheel barrow. One of the shops on Newport Street belonged to my grandparents, Frank and Florence Howcroft.It was a surgical goods shop.Frank was an optician and Florence ran the shop.They also had a chemist shop,maybe on the same street. The shops in that block were demolished in the late 60s/ early 70s.At that time it was being run by my mum’s sister, Joyce Entwistle. My dad sneeringly called it ‘The Johnny Shop’. Does anyone know if any of the shops on the left side of Newport Street sold china goods? I can see one that was a cafe and one possibly was a signwriter. The lamps on the right above the man peering into the shop window bear the marking K and L. I recall there was the Kettering and Leicester shoe shop at this site when I was a boy in the 1960s. Oddly enough I lived and worked most of my life between Kettering and Leicester.